No need to recap this particular story, because it is indeed, a retelling of the infamous movie. Liberties are taken with conversations and motivations outside of what we see on film, but these liberties are true to character and the story. Bracken has done an excellent job filling in the character development and showing each of the main protagonists as human, flawed, and hopeful. 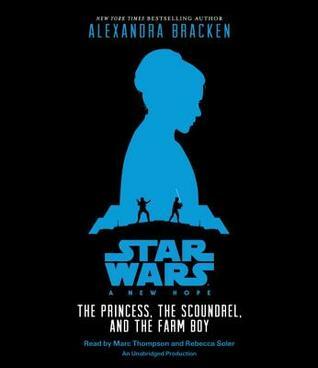 This is purely a story of Han, Leia, and Luke. There are no deep insights into the dark side and the Commander himself (which for this Darth Vader fan was a bit of a let down). For new fans (this is a kids book...not that it's really juvenile in quality), this is a great introduction to the story. And the audiobook was fantastic. Whoever this Marc Thompson fella is, he's fantastic with the voices. Bracken has thrown in a not of original dialogue from the movie as well which was kind of nice. There are plenty of sound effects and the voice of C-3PO is spot on. Just an all around quick and fun listen. If you're a Star Wars fan, or know of a little Star Wars fan, this is definitely worth a listen. Can't wait to get my hands on The Empire Strikes Back by Adam Gidwitz!